Don't be fooled ~ my passion is dressage~ but I have an extensive background in hunters and western as well! I am playing in the wonderful and fun new WESTERN DRESSAGE ! And I will be fortunate enough to be able to work once again with the Legendary Jack Brainard this season:) Looking forward to a fun and exciting year of learning! Busy year, Bill Robertson from Texas , former USET Show Jumping Team member will be joining us 7/28 through 8/1 for lessons in jumping and Natural Horsemanship. Clinic & demo at 11 am on Sunday July 31.. It was a great clinic!! Private/group lessons and training available for all disciplines! Offering demo's and clinics in Cowboy Dressage as well as schooling for western dressage classes incorporating natural horsemanship for the improvement of horse and rider. Over 50 years of horse experience and I still strive to learn more...keep an open mind and just absorb the knowledge that is out there! Over the years I have been blessed to be able to work with some of the top trainers in their fields, Dressage, Hunter/Jumper, Eventing, Reining, Western Pleasure, Halter/Showmanship and Natural Horsemanship. My background started with Hunter/Jumpers when I was a teen. From there I went into Eventing, then specialized in my passion, Dressage. In the late 80's I became involved with Quarter Horses and have been an AQHA Professional Horsewoman from the inception of the AQHA program. Having been teaching since the late 60's,my students and myself have many year end state, regional and national awards in Hunters, Eventing, Dressage, Western Dressage and AQHA as well as other breed awards. Also I have been breeding Warmbloods and Quarter Horses for over 20 years, currently standing my foundation Quarter Horse, The Contortionist. Enjoying all aspects of the horse world, I love having the babies to play with, teaching, training, competing and most of all, I love to learn. 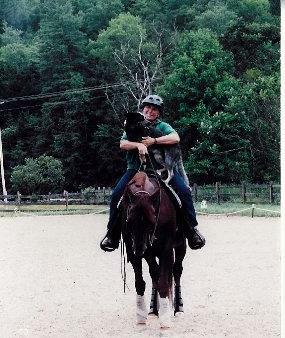 Over the past years I have dabbled a bit in Parelli, Clinton Anderson, John Lyons plus other Natural Horsemanship programs and realize that I had already developed into a "natural horsewoman" through the wonderful influences I have had over the years. The closest I have come to the carrot stick was working with Linda Tellington Jones back in the early 80's! Even though I do not routinely use a "carrot stick " I have always strived to "think like a horse", seeking to find better avenues in training and understanding, mostly trying to develop a good attitude. My horses are all fairly respectful of humans and for the most part have good attitudes & great personalities that make them all fun individuals to train. I believe in striving to understand the mechanics of the horse and mechanics of the rider. And to always go back to something either the horse or I understand when training in order to improve. I believe I posses a strong understanding of the basics of good horsemanship and realize there are many variations in what people think. But bottom line is that a good horse is a good horse and that applies to good horsemen no matter their style of training. As far as specific horsemanship skills I would say I am competent in handling babies through stallions. I believe in safety of the rider/handler. Having schooled horses successfully through the upper levels in dressage I believe I have a respectfully decent seat, hands and ability to understand riding concepts for Dressage , Hunters, Western Pleasure, Western Dressage and Reining. Many clinics and seminars with NEDA, AQHA, NEQHA, NRHA,NERHA, VQHA, USDF, PAT & LINDA PARELLI, CLINTON ANDERSON, LINDA TELLINGTON JONES, SALLY SWIFT. Again this year will be working with the legendary Jack Brianard plus clinics with Craig Johnson. I will also be attending clinics working on classical dressage ...watch for more info! 2011 demo's Vermont Dressage Days and Best of Gymkhana at the Champlain Valley Expo Essex Vermont. March 2012 we were fortunate enough to be able to participate in CNYRHA's NRHA clinic and Rookie days with Matt and Mike Flarida. Long drive down and back... but we had a blast and learned a LOT!! Well worth the trip :) I also learned my little mare Josie Boonsmal has a lot of heart! What a trooper :) Matt and Mike were great instructors and made the learning a lot of fun...and having a real full size arena to ride in was unbelievable... now we are creating one here :) Thank you CNYRHA , Mike and Matt!!! !